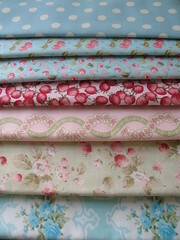 I alluded to an online fabric purchase here and here. Well that's it up there. The photo doesn't capture how scrumptious the cherries are... especially the larger one with tone-on-tone dots. The blue rose, green raspberry, and pink garden twirly ones were all on sale and fell into the "might as well" category. But I'm glad I did. Everything is so pretty and it all arrived at top speed. It was shipped on Friday from The Fat Quarter Shop and arrived on Wednesday. I discovered this place through my reading of yvestown, a lovely interior-decorating type of blog. This is the first time I've bought fabric online and while I will endeavour not to make a habit of it, this was a positive experience. Normally I like to see the colours properly and feel the fabric, so online isn't ideal, but the lure of browsing fabric in my pjs is pretty tempting. On that dangerous note, especially given that I've reduced the size of my quilt, I will not be buying any further fabric for it. I announce this publicly in the hope that in the glare of public scrutiny I will actually stick to my intentions. Heh heh. Even the inevitable ribbing from my SO doesn't prevent me from snooping in the fabric shops when i go traveling. And how can you go into a shop and *pass up* that rare, just so appealing, never to be seen again design? It's all about being a fabric junkie. Well, at least you aren't collecting period Elizabethan armoires or something equally massive. I too recently made my first purchase from The Fat Quarter Shoppe. I loved being able to brouse to my hearts content, going be to the same fabric over and over and over again before making a purchase decision. When I do this in a store I know I just look crazy and indecisive. And you definitely can't ignore the comfort of that pj option. Love the fabrics you've chosen. Can't wait to see them all stitched up!